Collecting and reprocessing plastics reduces the mountain of waste, avoids greenhouse gas emissions and makes new products out of used plastic. The Flottweg Sorticanter® makes plastics recycling easy and protects the environment. In plastics recycling, having purity of grades in the materials being processed is a central factor. Plastics can be separated quickly and efficiently using a centrifuge. The sorted plastics are obtained with a significantly higher level of dryness than in all other separation processes. Air bubbles, surface effects or dust on the plastics do not have any influence on separation. 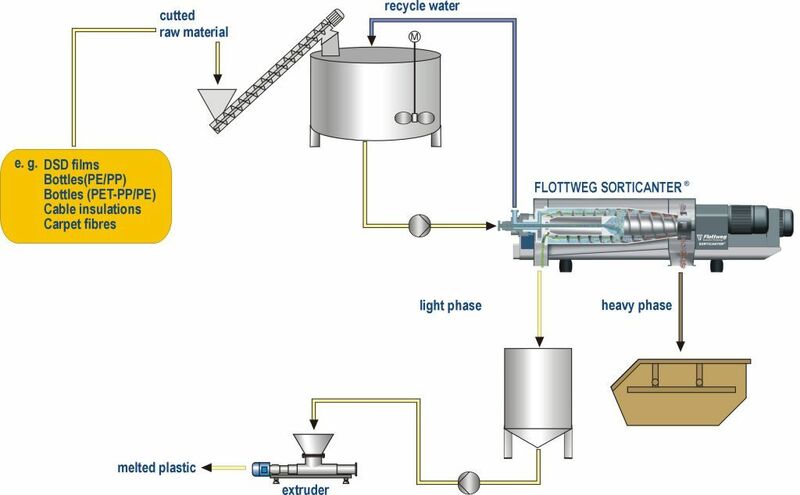 The patented Flottweg Sorticanter® ensures economical recycling by separating different types of plastic on the basis of their different densities. Flottweg was there when plastics recycling began on a large scale in Germany at the start of the 1990s. We supply complete lines which benefit from our significant store of experience. You can benefit from this experience, whether in the engineering, selection of machine components or in tailor-made measurement and control technology. We find the perfect solution for you.